The allergic reactions to poison ivy, oak, and sumac occur when sensitized people come in contact with urushiol oil. This oil is found in the roots, stems, leaves, and fruit of the plant. This oil is released if the plant is damaged or bruised. If not washed, oil from these plants may stay potent for years on clothing, tools, toys, and other items, especially in dry conditions. 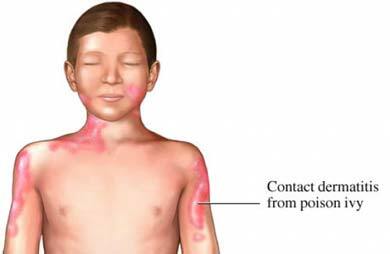 The main symptom of poison oak, ivy, or sumac is an intensely itchy, red rash. The rash appears within 24-72 hours of exposure to the oil. The rash often appears streaked and may develop into oozing blisters. The oozing material will not sensitize others. Diagnosis of poison ivy, oak, or sumac is based on the presence of a characteristic itchy rash and possible exposure to plants containing urushiol oil. If you have been exposed to poison ivy, oak, or sumac, wash your entire body right away. You can reduce your chance of getting a rash if you wash thoroughly with soap and water within 10-15 minutes of exposure. Using alcohol and water, wash all clothes, tools, and shoes that were in contact with the plant. One small study shows that cleaning with the oil-removing compound “Goop” or the poison-ivy prevention substance “Tecnu” is more effective than using soap alone. All 3 treatments reduced the occurrence of skin rash by more than 50% following contact. If you are diagnosed with a rash from poison ivy, oak, or sumac, follow your doctor's instructions. Learn what the plants look like and avoid all contact with them. Wear clothes that cover as much skin as possible when in wooded areas. Bathe pets in soapy water if you think they have come in contact with one of these plants. Wash any clothing or object that may have come in contact with these plants. Use an over-the-counter medication (such as Ivy Block, Stokoguard [ bentoquatam 5%]). This may help prevent a rash if applied at least 15 minutes before exposure. Agriculture and Agri-Food Canada. Poison ivy, western poison oak, poison sumac. Publication No.1699. Contact dermatitis. EBSCO DynaMed Plus website. Available at: http://www.dynamed.com/topics/dmp~AN~T114930/Contact-dermatitis . Updated May 10, 2017. Accessed October 2, 2017. Outsmarting poison ivy and its cousins. US Food & Drug Administration website. Available at: https://www.fda.gov/ForConsumers/ConsumerUpdates/ucm049342.htm. Updated June 6, 2017. Accessed October 2, 2017. Stibich AS, Yagan M, Sharma V, Herndon B, Montgomery C. Cost-effective post-exposure prevention of poison ivy dermatitis. Int J Dermatol. 2000;39(7):515-518.